I said at the end of the first article that I would progress to the next phase in this one. But the request for a screenshot of the app at this point got me to thinking that it would be worth more to fledgling QML developers if I backed up and broke down the code. So let’s do it. There’s a lot to cover, so I’ll spread it across two or three articles. There’s more going on here than my final app would really need, but I was working for two things here: one, to expand the original code example’s functionality for anyone following me, and also to provide visual feedback of functionality for my own drive trials. Ultimately, the home screen will be very simple and the app will rely on a separate configuration screen (or menu) along with notification audio and dialogs screens. For safety’s sake, and especially given that this app is to reduce driver interruptions, emphasis will be on audio. As you can see, I placed units selection at the top of the screen. That made it easy to toggle back and forth between miles-per-hour and kilometers-per-hour during testing. Speed certainly doesn’t need the level of precision shown; I should just truncate at the decimal point. The screen above shows that typical US measurements are selected (feet, miles) and the speed shown is in miles per hour. 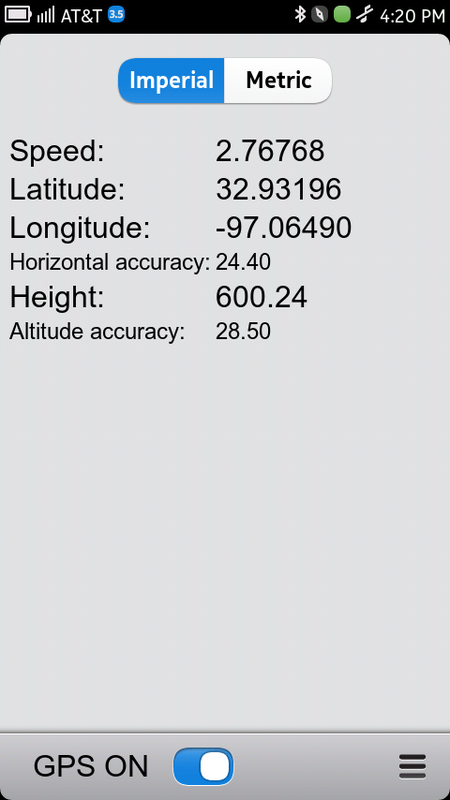 I could also add more context (i.e., “MPH” or “KPH” after the speed readout) but that’s not necessary for this app. Now, let’s dig into the code, starting with main.qml, which is automatically created for Qt Quick projects. text: gpsSwitch.checked ? "GPS ON" : "GPS OFF"
If I understand right, showStatusBar: true makes the Toolbar visible. You’ll also see a menu item referenced in the last code chunk. I haven’t got to that yet, but I’m hoping I can use the popup menu for settings. There really isn’t much to main.qml on this or most other projects I’ve looked at. It’s my understanding that keeping the page loader simple and using individual pages for specific app features is the best practice. Someone correct me if that’s wrong! On a related note, while checking tour dates of musical groups I enjoy, I realized there wasn’t an event planner app for MeeGo Harmattan that would suit my purposes. So I’ll make that another documented project, one that might actually be easier than this one. One recurring, general gripe: I’m really perturbed by some common Qt Quick elements being documented, separately, as both Symbian and MeeGo types. PageStackWindow is one example (note that I deliberately linked to MeeGo Harmattan documentation). Why is this? This entry was posted in Getting Qt, Into Outreach, Mentioning Maemo, Mentioning MeeGo, Smooth Codings, The Write Stuff and tagged forumnokia, GPS, LinkedIn, MotoRing, N9, N950, Nokia, QML, Qt. Bookmark the permalink. ps Do you really need to set the parent for ToolBarLayout? I don’t think I’ve ever done that. As for the ToolBarLayout parent setting– I’m not sure. That’s how the original code example was and I haven’t messed around with all of it yet. I’ll test that. What a coincidence! I was working on this yesterday and figured out how to have multiple pages! Create another QML file starting with an uppercase character and place everything wrapped around a Page element, give the Page element an id, now you should be able to reference this in the MainPage.qml file, for example mine is called Search.qml, the id of the page is searchPage, so I can say when a button is clicked i.e. onClicked: searchPage.visible = true. That looks too easy! 😉 But I’ll try it!